The stock market’s volatility index (VIX) spiked today from a very low level (from less than 14 to 17). This study looks at what happens next to the S&P 500 when VIX spikes more than 25% from under 15. Here are the S&P 500’s forward returns for the next 1 week, 2 week, 3 week, 1 month, and 3 months. But as always, we need to apply context to market studies. 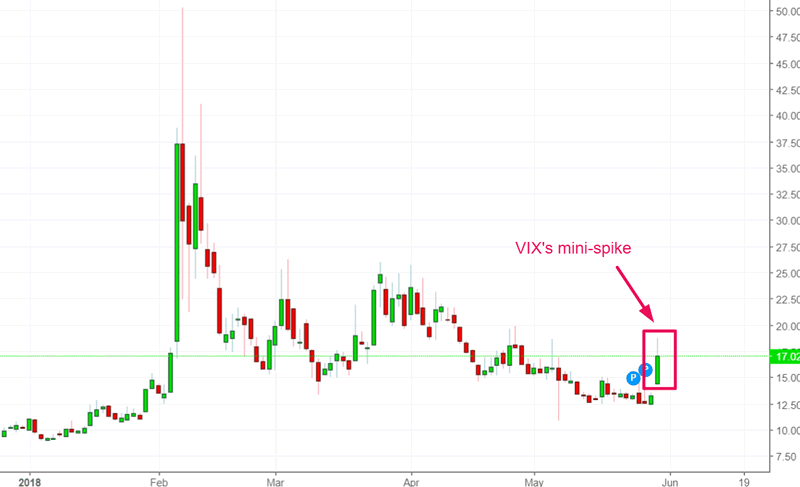 The recent spike in volatility (VIX) has occurred after a recent and bigger spike in January-February 2018. In other words, today is the “return” of volatility. What happens next to the S&P 500 when VIX spikes more than 25% from under 15 AFTER VIX was above 20 less than 6 months ago. Here are the S&P 500’s forward returns. Notice how the forward returns are more positive. The stock market went up after this signal. The stock market faced a little more downside over the next 2 months, and then soared. The stock market made a “significant correction” in the next few months after this signal came out. The Medium-Long Term Model predicted the significant correction. The S&P 500 swung sideways over the next 3 months, making a “small correction” from September-October 2014. It eventually trended higher. The stock market was in the middle of a 6%+ “small correction”. The downside was limited, and the stock market’s rally soon resumed. This signal occurred when the S&P 500 was in the middle of making a small pullback. The stock market trended higher over the next few months, even though there was a 6%+ “small correction” along the way. This signal occurred when the S&P 500 was in the middle of making a small pullback. The stock market trended higher over the next few months. This signal occurred near the market’s bottom. The S&P trended higher over the next several months in a choppy manner. The stock market’s downside was limited after this signal came out. The S&P 500 trended higher over the next year. Most cases saw a little more downside for the S&P 500 over the next 1-3 weeks (i.e. only a few cases were positive throughout the entire next 1-3 weeks). 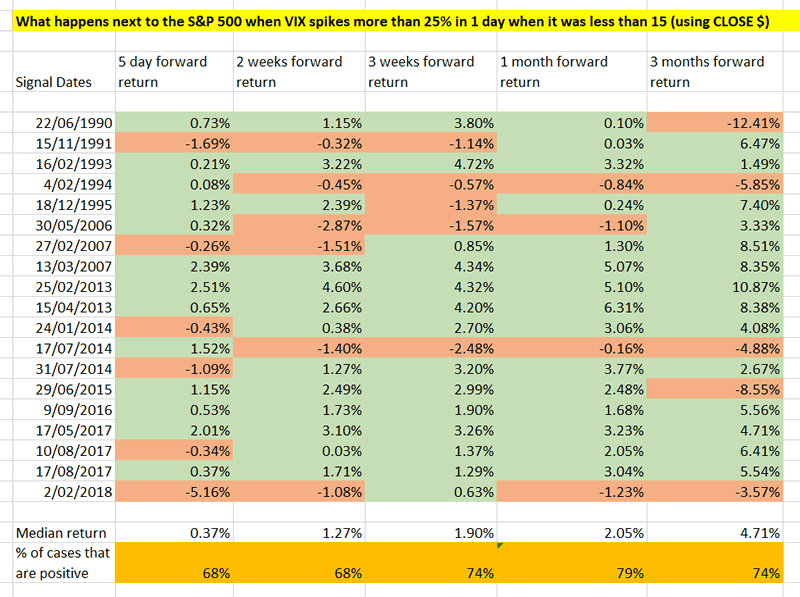 HOWEVER, the stock market usually trended higher over the next 1-3 months after VIX spiked the way it did today. This study suggests that the stock market’s short term downside is limited, and that the medium term outlook is bullish.